We are crushing 2019 movie goal. CRUSHING it, I say. Three films in the first 13 days of the year I still stand by the goal of 15. 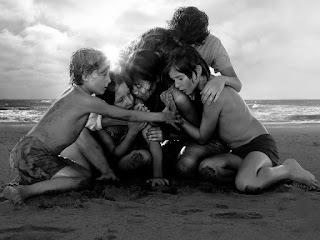 As Raybeard alluded to the other day on my 12 of 12, he was hoping Roma was the movie we had seen. Obviously by now you know it wasn't - but as I mentioned, it was on the list. The short list at that. We actually saw it the next day, but I'm just getting around to the post. Now, before we go over the movie, I should say it made a brief during Mike's and my back-and-forth the other night at the Golden Globes award program. I can and can't give you a plot to Roma. There is one, of course, but it's not overt. It's a bit of memory from the writer, director and director of photography, Alfonso Cuarón's life. Knowing next to nothing of it when we saw it, for the first quarter, I was just uneasy waiting for something to happen. Rephrase: that something was going to happen. The thing is, things are happening, but it's subtle. There isn't debris coming at the shuttle and space station like there was in Cuarón's Gravity, and nary a whomping willow or dementor, as there was in his highest grossing movie - Prisoner of Azkaban. The movie follows a girl who work for, and lives with, a family in a small town outside Mexico City - called Roma. Cleo is the woman who by her station, is the caretaker for the children. Cuarón dedicates this to the woman who helped raise him. While clearly there is a loose plot, I'd say much of the movie is about (bl)observations - from the audience to what is on screen. The visuals are amazing. Shot in black and white, the intricacies and the wider shots are just spectacular. There is a recurring theme of the jets overhead flying into and out of Mexico City. Does it mean that life is moving on for folks outside of Roma? Is it mean to be that the world is large and this is just a microcosm? There is also a plane reference that was the worst and most blatant foreshadowing reference I've ever seen. And the street where the family resides and the people who inhabit and use said street, is also recurring. Cuarón, I believe, purposefully uses an opportunity when the family goes to the movie to see the 1969 film Marooned, which may or may not have been the impetus for (and a nod to) his own film, Gravity. Yes, the movie season is young (even if this was a 2018 release), but so far it has been the best movie I've seen of the three. Still no sign of 'Roma' coming to these parts for a 'proper' theatre run, though I'm hoping that as it's sure to get notices, positive ones, and as the awards season approaches, it could well make cinema owners decide to give it a chance. I do hope so. I'm intrigued by your mention of a 'plane' reference. If I manage to see the film I'll brace myself to gasp with either astonishment or ridicule as appropriate. Btw: I remember seeing 'Marooned' on its release way back in '69 and was most impressed, as were just about all of the reviews. Never seen it again since, though. I'd like to. This movie, while visually beautiful, is a total waste of 2 hours. Maybe my mind wandered, but what blatant foreshadowing? Amazed that this is up,for best picture. Best Director? Sure, why not.